How can I look like Alice Cullen? How do I recreate Alice Cullen’s clothes? How do I style my hair like Alice Cullen? Where can I buy Cullen contact lenses? These are very general questions, ones that you can find the answers to in the form of tutorials and YouTube videos all over the Internet – and, yes, even on my blog. But the great thing about WordPress is that they track all kinds of stats and analytics – where your readers are coming from, for instance, and how many views you receive per day – including very specific Google search terms. 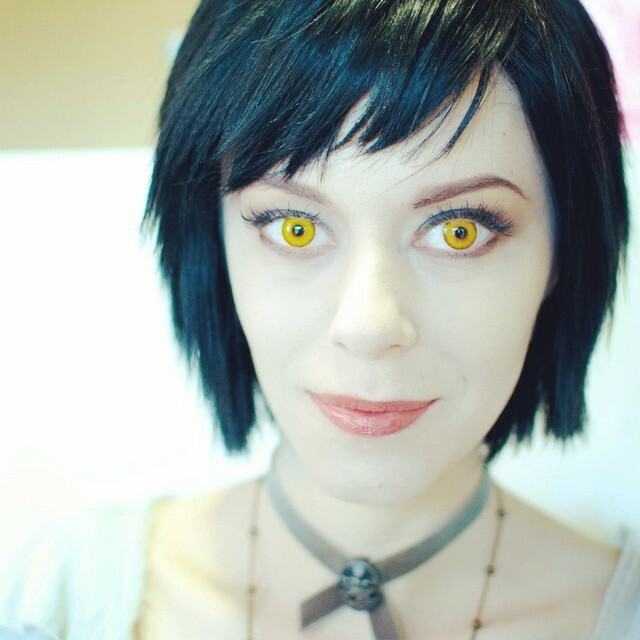 Here’s lookin’ at you, “picture of two eyes contact lenses only” and “have you seen my baseball” – yes, those are real search terms that lead someone to Go Ask Alice Cullen. But in the middle of some baffling terms are genuine questions that come up over and over again, so I wanted to take a stab at helping those people out. Below are answers to the five most common search terms that lead people to my blog. What are the brand of Alice’s flats in Twilight? These shoes are by Sam Edelman. Their product name was Cruz Flat Sewter Shoes. They came in two colours: pewter and bronze. Unfortunately, these shoes were sold out in their screen accurate pewter colour by the time Twilight hit theatres, but bronze could still be found in store on occasion. At this point, these shoes are extremely rare and most likely to be found on eBay or clothing sites like PoshMark – if you can find them at all. 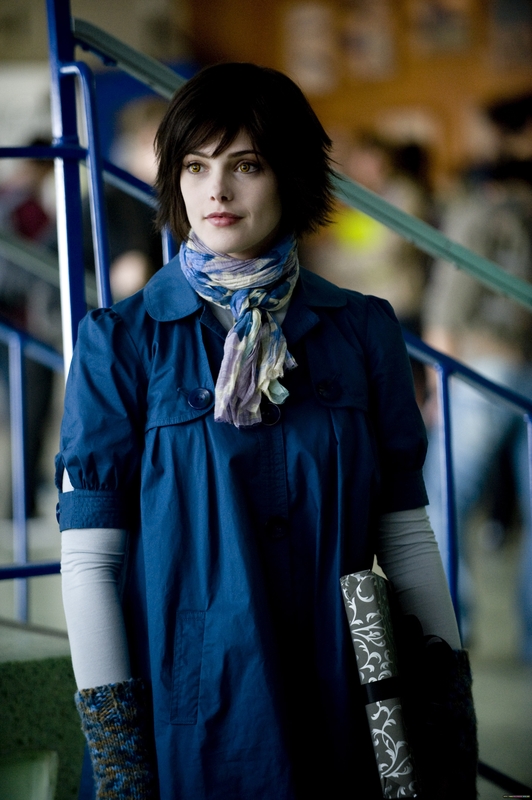 What is the brand of the blue jacket that Alice wears in New Moon? This blue jacket, as worn by Alice the morning of Bella’s birthday, is a blue smock-style jacket by Zara. It’s a loose, flowing style and has a gorgeous floral lining. This coat is rare, but it does crop up on eBay occasionally – often at very high prices. Your best bet? Check out UK eBay. Zara is a very popular European brand, so you’re more likely to find secondhand Zara clothing on European versions of eBay. Even with shipping costs and currency conversion factored in, you’ll only pay a fraction of the cost you’d pay on American or Canadian versions of eBay. Please note that CosplaySky offers a cost-effective replica of this jacket if you can’t find the screen accurate version. While it’s not perfect – the colour is slightly different, the general shape of the garment isn’t as accurate, and it doesn’t have the same floral lining – this is a decent replica. I purchased it myself before I found the Zara smock, and to be quite honest, non-costumers couldn’t detect a difference. Rarity: High – but can be surprisingly accessible if you know where to look or are willing to purchase a replica! Where can I find Alice’s Zara star button vest, as seen in New Moon? Alice’s star button vest, also by Zara, is definitely a rarity. In fact, only a handful of Alice costumers own one. I’ve only ever seen one on American eBay – but I’ve seen several pop up elsewhere: on German eBay. For the record, I don’t speak German. At all. But Google translate let me know that I should be searching for Zara weste on German eBay, and then limiting my search terms to damenmode. Give it a try – you never know what you’ll find. It’s how I got my vest! Please note, however, that if you’re going to be buying on International versions of eBay, you WILL need the help of someone living in the host country. They may need to bid on the auction for you or have it shipped to their addresses before forwarding it on to you, especially if you don’t speak the language the auction is in. That’s part of the reason why it’s so important to have a network when you cosplay – it allows everyone to help each other out! 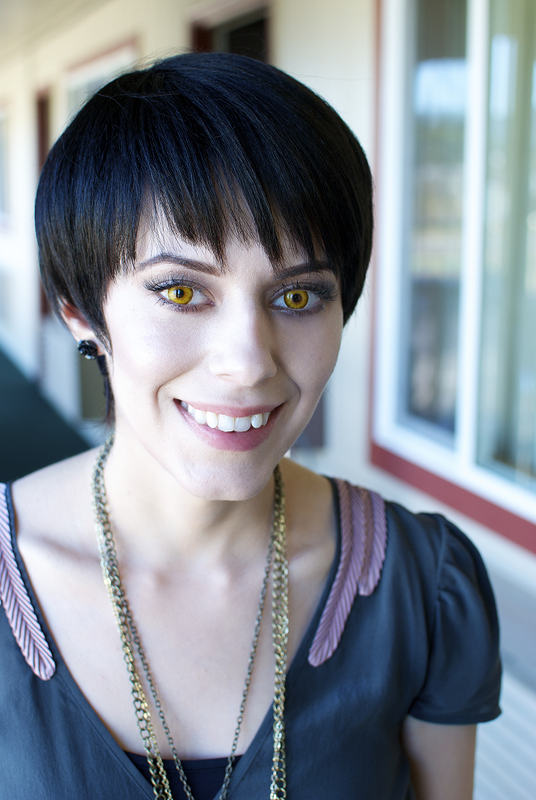 Where can I buy an Alice Cullen wig? The short answer here is that you can’t. I mean, there have been retailers that claimed to sell Alice Cullen-style wigs, but I’m going to be honest with you: they’re extremely low quality and styled poorly at best. You want to avoid these pre-styled wigs at all costs. What you DO want to do is buy a human hair or synthetic wig that can withstand heat styling. Ideally, this wig would have a natural-looking part. You’ll want to look for something that’s similar in length, colour and shape to the Alice wig you’re trying to create. 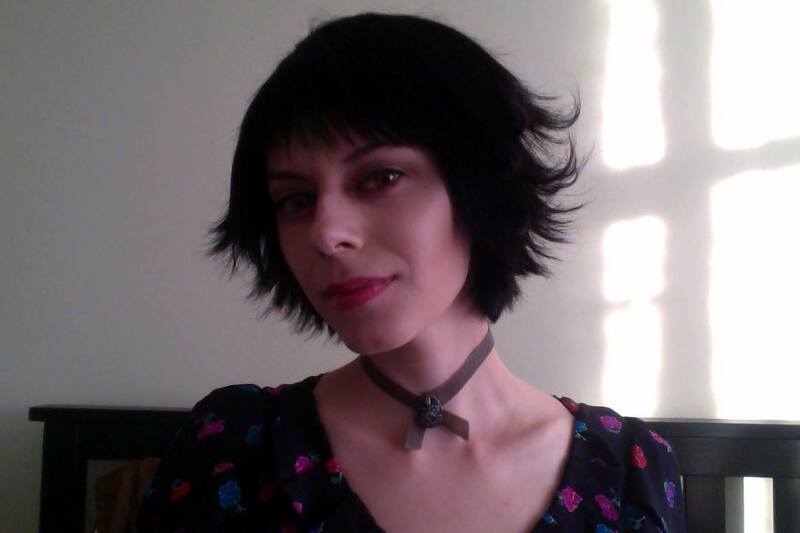 For reference, I bought the Duby wig in black as the base for my New Moon and Twilight wig. Then, unless you’re a hair stylist yourself, you’ll want to take this base wig to a hair stylist, armed with photos of Alice’s hair from every possible angle. Before you book your appointment, don’t be afraid to ask for a stylist that has experience with cutting and styling wigs. You’ll have to wear the wig during your appointment so the stylist can make sure that he or she is cutting it correctly, in terms of length and shape for your face, so remember to bring a wig cap. Your own hair will need to be neatly tucked under the wig in order to avoid accidentally cutting it as well! It’s also important to assert yourself while your wig is being cut. If you don’t like the direction you see the cut going in, SAY SOMETHING! A wig, unlike your real hair, obviously does not grow back. Investing in quality wigs and then paying to have them styled can be a costly venture, so it’s okay to voice your opinion and ask for an extra half inch to be taken off, more layers to be added, or the bangs to be choppier. With that said, your stylist is the professional – so if they tell you that your requests will compromise the style of the wig or risk leaving the wig netting showing, take their advice! Last note: Your stylist will style the wig for you initially, but there may be maintenance required on your end in order to keep the wig looking great, especially if you’re going for Alice’s Twilight and New Moon looks. Human hair and heat-resistant wigs can be re-shaped and styled after they’re cut with a flat iron and hair spray, so you may want to revisit your YouTube tutorial of choice on how to achieve Alice’s wispy, flipped look. What are the brand of the taupe shoes worn by Alice Cullen in Breaking Dawn: Part 1? These shoes are kitten heels by Marc Jacobs, called crossed strap pumps. They were featured on the runway for Marc Jacobs in Fall 2010. There are two versions of these shoes, one in black and one in taupe (or “mud,” as Jacobs has labelled them), and Alice wears them both. Please note that these pumps come as full heels and as kitten heels, and the higher heeled versions are much more common finds on eBay. In fact, I’ve only seen the kitten heeled version of these shoes once in each colour, and I unfortunately lost out on both auctions. Be aware of two things: unless you manage to find auctions that fly completely under the radar, you are VERY likely to get into a bidding war with another costumer over these shoes, and that could get pricey. Also be aware that these shoes reportedly run small, like many of Marc Jacobs’ styles, so going up by half a size may be beneficial. 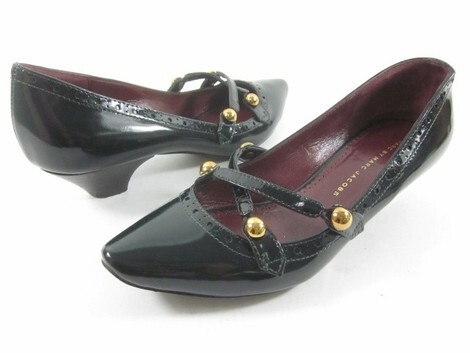 It’s also important to note that as Marc Jacobs is an American brand, you’re most likely to find these shoes on US eBay. Well, that’s it for me! There are more questions, which I’ll be answering in future, but I figured this was a good place to start. Remember: If you’d like to ask me a question directly, I’m available through e-mail sent to alicethepixie@gmail.com.